Tavo Gloves For iPod Clickwheel | OhGizmo! Ever try to lower the volume on your iPod while out, on a cold winter? (You know, the kind of winter that makes the snot in your nose freeze over…) Well, then you know that it invariably involves removing a glove and exposing some skin. And we can’t have that. So that’s why Tavo Products’ special gloves are so groovy. The tip of the index and thumb are made of nylon strands coated with silver alloy which allow you to work any touchpad with no problem. And they also presumably keep you warm. At $35, it ain’t half bad. Seriously! Come on! Is this absolutely neccessary. Why do people need this? It’s just more pointless crap advertised to take more money from the consumer, when they don’t really need it. 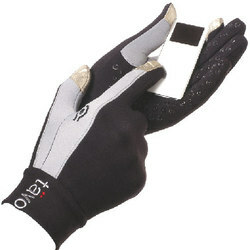 If you’ve ever gone for a run on a very cold day and tried to use your iPod you will know why these gloves are usefull. I wish I lived in Southern CA or Florida like you do where these would be useless. Although I believe in a person’s fundamental right to make money, it is a little over the top. How about this: Get your playlist running, set your volume, hit play, put your gloves on and your hat or whatever and go for a run……there, I just saved you all few bucks. I think any accessory is as good as there is a demand for it. One step ahead of all of you. My Minidisc player (Hi-MD) has buttons that work through anything you can press them with. Who says old fashioned is bad? Btw, alot of people want to change volume or songs in the middle of a walk… its not unreasonable to want a way out of planning your playlist in advanced, if its freezing and you’re stuck with something touch-sensitive. I’ve seen people dish our 70 for a pair of serious (or sometimes, just pointlessly fancy) gloves, so if these are alright as gloves, I wouldn’t go rabid over it. damn! I was just thinking about an idea like this the other day while trying to use my ipod and treo in the car. They stole my idea! Seriously, if they weren’t so damn ugly, or if maybe you could just add a tip onto gloves you already have, this would be great.